Alaina introduced me to Chocolate Covered Katie’s creative oatmeal recipes. As loyal oatmeal eaters, we were excited to experiment with her various concoctions. We both had a few failed attempts, so we challenged ourselves to create our own delicious breakfast oatmeal recipe with a touch of creamy chocolate sweetness. Over the past week this has become the reason I get out of bed in the morning. When my alarm goes off at 5:15, I am so tempted to snooze, but knowing that gooey chocolate and peanut butter oatmeal is waiting to be prepared helps me get out of bed. Mix rolled oats and chocolate chips in a microwavable bowl. Add the milk. Drop peanut butter on top in the middle (it will soften and get gooey and yummy), and sprinkle a few more chocolate chips, and place banana slices on top. Microwave for 1-2 minutes, depending on your microwave oven, and how you like your oatmeal. I like mine a little crunchy. (Mine in Michigan is ready in 1 minute, and here in LA is ready in 2. Strange huh?) Stir for gooey deliciousness. Be happy to be awake. 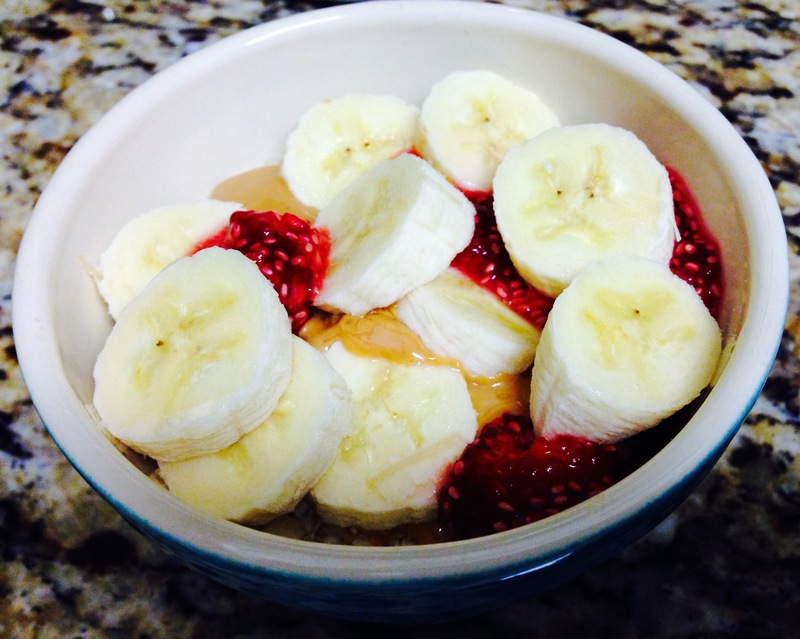 If you like oatmeal then you need to read this post. I made the banana custard one and it was seriously one of the best things I've eaten recently. im doing this!! a reason to buy chocolate chips!